Altovar tried to steal biomimetic gel from the Deep Space 9 infirmary. 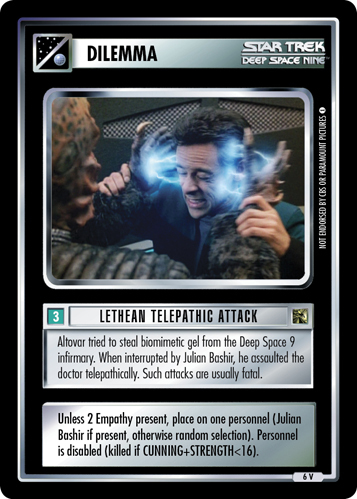 When interrupted by Julian Bashir, he assaulted the doctor telepathically. Such attacks are usually fatal. Unless 2 Empathy present, place on one personnel (Julian Bashir if present, otherwise random selection). Personnel is disabled (killed if CUNNING+STRENGTH<16).